U.S. Navy submarines are categorized into three main classifications: Attack Submarines (SSN), Ballistic Missile Submarines (SSBN) and Guided Missile Submarines (SSGN). Attack submarines seek and destroy enemy submarines and other surface vessels. Modern attack submarines are also equipped with Tomahawk cruise missiles, which give them added land attack capability. They can also engage in mine warfare, perform Intelligence, Surveillance and Reconnaissance (ISR) missions, and support battle group operations. Ballistic missile submarines, commonly referred to as Boomers, perform strategic deterrence missions, providing the United States with its most survivable and enduring nuclear strike capability. They are designed for stealth and for precise launches of nuclear warheads. Guided missile submarines provide the Navy with an unprecedented combination of strike and special operation mission capability. Although the majority of the submarine force consists of these three ship classifications, the Navy developed six modified designations throughout the years. From the 1920s through the 1970s, the U.S. military incorporated an extensive amount of asbestos-containing products into the construction and repair of Navy vessels. The material’s heat resistance, insulation properties, versatility and affordability contributed to its wide use in naval shipbuilding. The small, cramped spaces of submarines required pervasive use of asbestos, because it is a flexible, lightweight, insulating material that can be manipulated to fit such small conditions. On an underwater ship, the danger of a fire is much greater than on surface ships, where escape is possible, increasing the need for asbestos products. However, only the attack and ballistic missile types remain in active service today. Chrysotile asbestos, specifically, was used for insulation, gaskets, packing and tape, while amosite asbestos was used for lightweight insulation aboard Navy submarines. Asbestos was also present in water pipes, valves and flanges of these ships. As these asbestos products were used on a daily basis, they likely became torn or worn, releasing asbestos fibers into the air. Prolonged inhalation can allow some fibers to become lodged in the lining of the lungs. Accumulation of these fibers over time can lead to tumor growth and the development of mesothelioma cancer or other asbestos-related illnesses. Archived documents, including purchase orders, repair logs and related letters and memos, confirm the extensive use of asbestos products aboard submarines. The majority of these documents detail use of asbestos gaskets for flanged valves, most likely in torpedo rooms. 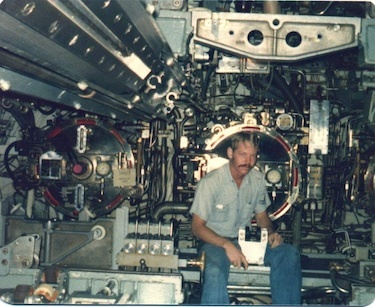 USS Blueback's (SS 581) torpedo room, 1975. USS Triton (SSRN 586/ SSN 586) documents from 1956 to 1960 describe ample use of asbestos use aboard this vessel, including wide use of compressed asbestos, wire asbestos cloth for piping thermal insulation, quilts of asbestos felt for pipes, asbestos spiral-wound gaskets for main turbine and impregnated pure asbestos for automatic drain valves. Documents dating from 1940 to 1954 pertaining to USS Croaker (SS/SSK 246) describe asbestos use in auxiliary power cables, ground asbestos for cork insulation and asbestos felt used for machinery. Navy shipyard workers, repairmen and maintenance men responsible for constructing, maintaining and repairing Navy submarine ships beginning in the 1920s through the 1970s are among those at the highest risk for asbestos exposure and developing related long-term health complications. Many of these men replaced old asbestos insulation with new insulation, a job that often required some manipulating and maneuvering of pieces of asbestos insulation. Through this process, asbestos fibers were likely to become airborne. The routine replacement of gaskets and other asbestos-containing products also contributed to their heightened risk of exposure. The vast use of asbestos throughout the ships endangered everyone onboard. As crew members spent long periods of time inside small submarines, asbestos fibers from various parts of the ship re-circulated throughout the vessel, increasing crew members’ risk of significant exposure. In 1862, the USS Alligator became the first known submarine of the U.S. Navy. She served during the American Civil War, but was soon after destroyed in bad weather. Since then, approximately 800 Navy submarines were used. Holland (SS 01) and her crew at the US Naval Academy, Annapolis, MD., circa 1901-1902. 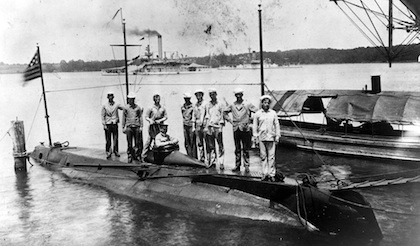 From the beginning of World War I in 1914, the world saw the first U.S. Navy submarines in battle. These ships continued to see vast improvements to their construction and technology through the Vietnam War. During World War I, the submarine truly came of age. 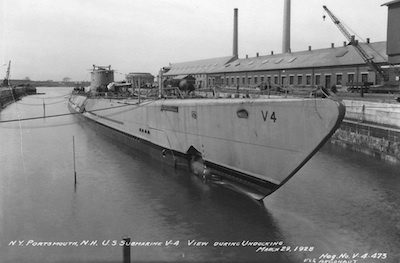 Upon acquiring John Holland’s Holland VI submarine – the predecessor of modern submarines – in 1900, and renaming it USS Holland (SS 1), the U.S. had gained a small lead on its European counterparts. This ship used an internal combustion engine for surface operations and an electric motor for running submerged. The First World War era brought significant improvements in the construction and technology of these ships. By mid-1916, the Submarine Force U.S. Atlantic Fleet was established, and the Appropriations Act of 1916 called for rapid construction of 30 new ships. A year later, the Submarine Force U.S. Pacific Fleet was established. During this time, advancements were in the adaption of diesel engines, rather than gasoline, and the wide use of radio communication that allowed the boats to be directed from shore. Despite an early lead, by the time the United States declared war on Germany in 1917, European technological advances surpassed that of the U.S. Although the U.S. Navy did have 42 submarines in commission, all of them were intended for harbor or coastal defense. Nonetheless, some of them were deployed to aid in the anti-submarine campaign in the North Sea, the English Channel and the Irish Sea. Other submarines, those of the N and O classes, patrolled American coasts. During the time between the two world wars, the Navy focused on constructing improved ships to prepare for future battle. Priority was placed on submarines’ stealth ability, speed and endurance. Previous ships were too small to fully deliver these qualities. In 1925, the first new submarine fleet was authorized for construction, beginning with USS Argonaut (SS 166). This ship had twice the battery volume of earlier designs, and it became the primary basic design to build upon during the next world war. However, improvements to her speed, power and agility were critical. The United States entered the Second World War in 1941 after the Japanese Imperial Navy initiated a devastating surprise attack on Pearl Harbor. Deploying the reliable Balao, Tench and Gato classes, the U.S. submarine force scored the biggest victory of any force in any theater of the war. The force destroyed about 1,300 enemy ships, which accounted for 55 percent of all enemy ships lost during the war. It also had the lowest casualty rate of any submarine service during the war, with the loss of 375 officers and 3,131 enlisted men. This dominance has become known as the silent victory. U.S. submarines most notably attacked Japanese and German submarines and ships in the Atlantic and Pacific oceans during the war, but they also rescued pilots who landed in the sea, including former President George H.W. Bush. Toward the end of the war, the Japanese had very few ships left. With no desire to give up, U.S. submarines used newly developed FM sonar sets and penetrated Japan coastlines to attack anchored supply ships and warships, concluding their silent victory. After World War II, undersea warfare was revolutionized. The U.S. modernized its submarine force by building upon the advanced submarines of Germany during the Second World War. The Navy saw the need for a faster craft that could travel deeper and stay underwater longer. USS Trout (SS 566) at sea, circa 1969. After the Second World War, the Navy began building experimental submarine designs. The Tang class was the first postwar submarine to be constructed. This class represented the first step toward greater underwater endurance and speed. It also provided a newer hull design that was effective during war. In January 1955, USS Nautilus went to sea and set a standard for new submarine designs that would later take part in the Vietnam War. Her underwater endurance was tested, and she only needed to travel above the surface to allow crew members to see their families and to see daylight. The Seawolf and Skate class submarines soon followed USS Nautilus, and together they demonstrated the new effectiveness of this class of ships. The quest for improved functionality continued with the experimental, conventionally powered USS Albacore. The high speed of USS Albacore’s teardrop hull, combined with USS Skipjack, a fast attack submarine, formed a new paradigm, and every submarine thereafter followed the same basic design. During the Cold War, the new and improved attack submarines proved very effective in resolving the Soviet threat in the Atlantic and Pacific oceans. The ships that derived from the USS Nautilus and USS Albacore were the most adequate ships to launch the powerful ballistic missiles. 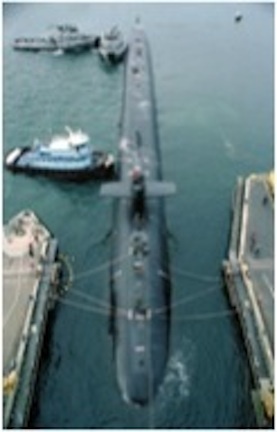 USS Alaska (SSBN 732) is guided into an explosives handling wharf at the Naval Station. Since the 1960s, ballistic missile submarines (SSBN) have provided effective strategic deterrence. SSBNs can move fast, deep and can reach just about any target. Today, there are two active Navy submarine classifications, the Ohio class ballistic missile submarines, which are equipped with approximately 200 nuclear bombs in 24 long-range intercontinental missiles; and the attack submarines, which are equipped with shorter-range, air-breathing missiles that deliver accurately across the sea and over land. The Navy is building the next generation of attack submarines. The Virginia class is intended to perform multiple war fighting missions. These new ships will have a fly-by-wire ship control system, which will improve shallow-water ship handling, special features to better support special operation forces and large lock-in / lock-out chambers for divers. USS Virginia, the first of the Virginia class, was commissioned in 2004. Since then, nine ships have been placed in service, and the remaining ships were planned for construction in 2014.